"Have a great day! Love, Mom"
So, I'm at it again with some creative options for DIY lunch notes. Although I still resort to the occasional personal note, as seen HERE & HERE, it's fun to mix things up. First, there were the Knock-Knock Joke lunch notes. Then there was the I-Spy Lunch Box game. 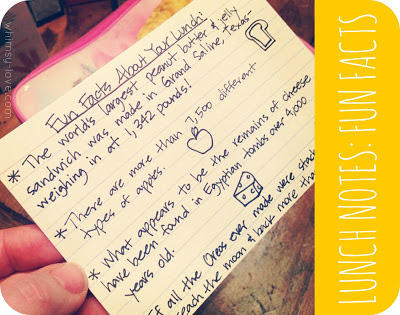 And now there are the Fun Facts About Your Lunch lunch notes. I simply google random facts about whatever I've packed in my girls' lunches for that day. And I'm gaining knowledge along the way. •Did you know that John Glenn, the first American astronaut to orbit earth, carried applesauce in squeezable tubes on his first space flight? •And the chocolate chip cookie was created in 1930 by accident by Ruth Wakefield? My mum used to put little notes in my lunchbox when I was at primary school. Things like, 'don't forget you've got Brownies/tap dancing tonight! have a lovely day!' mostly and it did make my day, always! This is *such* a lovely idea. I don't know where you find the time and energy for all the awesome things you do with your girls and for your community - you're an inspiration. With love from the UK!